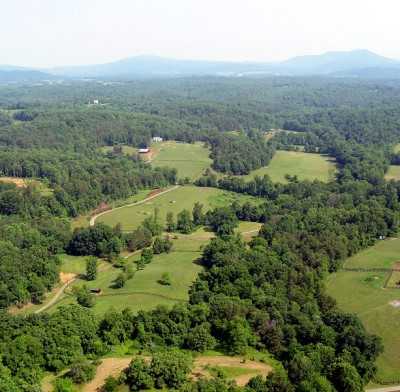 Need a Virginia Horse Country Base? New stable; 12x12 rubber-matted stalls, wash stall, all-weather arena, show jumps, and cross-country schooling, including all-new beginner level course with water, ditch, bank, and drop. Endless dirt roads and trails, pasture, paddocks. Hack to Old Dominion Hunt meets; within 1 hour - 12 other Virginia hunt clubs. Near Commonwealth, Great Meadow, Morven. 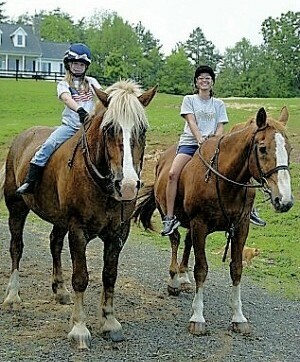 Virginia's top-rated 'horse motel' for through travelers, visiting riders and competitors. 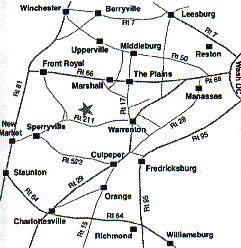 Convenient to I81, I66. Hunter's Rest is surrounded by literally thousands of acres of untouched privately owned and well protected paradise, woods and fields with a spiderweb of trails. That's the house and barn just left of center in this photo. 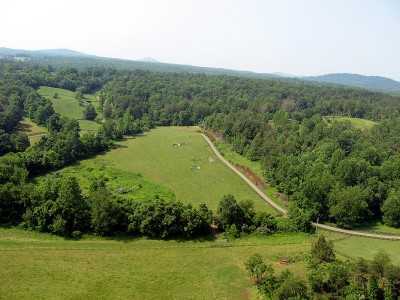 The schooling field and gallop fields are shown, as are two of the large pastures on the farm. In the background to the northwest are Mt. Marshall, the Peak and Thornton Gap in the Shenandoah National Park. 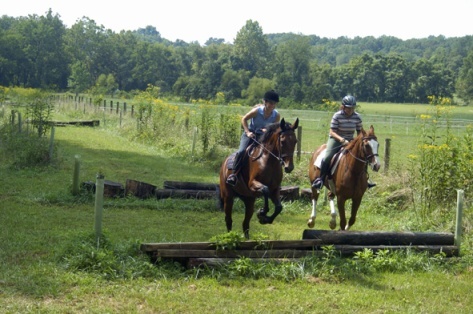 There are hundreds of miles of public trails in the park; much of the farmland around Hunter's Rest is available -- with permission -- for trail riding as well. The modern stable has all the conveniences: including hot-cold wash stall, concrete aisle, large airy stalls. It is easily accessible with a circle driveway - plenty of room for rigs of all sizes. The house, just steps away, is a modern version of a traditional Virginia farmhouse, complete with country kitchen, formal dining room, stone fireplace in the Fox's Den library, and a variety of rooms. 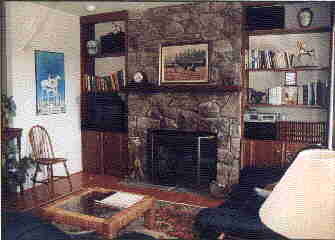 Hunter's Rest has all the newest periodicals and a full horse and field sports library for your reference while enjoying your stay. Fine dining and superb views are just part of the Hunter's Rest experience. 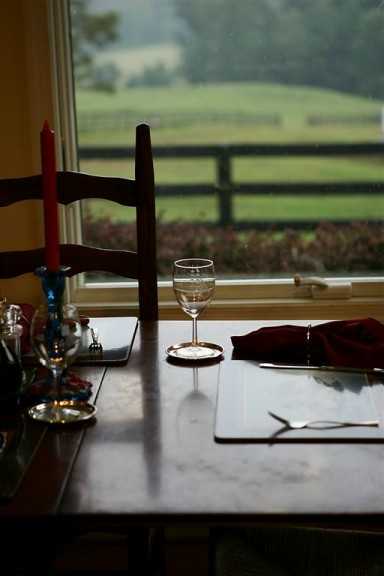 The 'Rest' of the story comes in the quiet relaxation you'll find for your horses and yourselves at our comfortable farm. Being at Hunter’s Rest is a legitimate farmstead experience – help collect eggs in the morning for farm-fresh breakfast, tune in for afternoon “guinea hen tv” – an entertaining look at the flock of guineas as they forage for bugs and tasty morsels around the house, barns and pastures, enjoy an evening serenade by the resident peep-frogs in the formal frog pond in the gardens out front, and listen to the nighttime lowing of the cattle that graze our riverside pastures. Hunter's Rest has a new "Aiken Line" of user-friendly natural fences set in a row along the river bottom. They are low, wide and inviting -- and there is a "trainer's line" (without fences) running alongside so the instructor can ride with you to provide tips. Hunter breeding is a Hunter’s Rest specialty. Hunter's Rest has a wide variety of angelic school horses to suit all levels of rider for summer camps, weekend or week-long riding clinics and for the farm's regular lesson program. 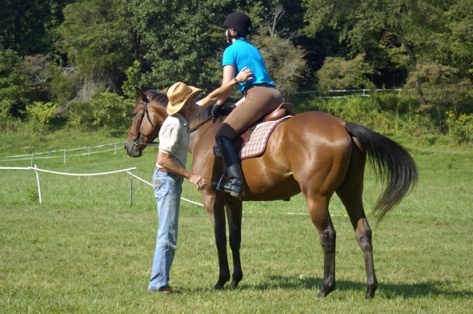 Riding instruction with emphasis on fun and good, solid, classic position. 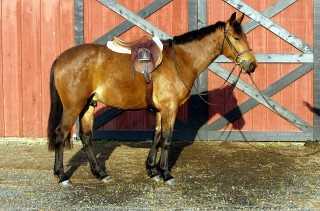 Specialties include hunt seat, dressage, cross-country, trail riding, foxhunting, jumping and more. 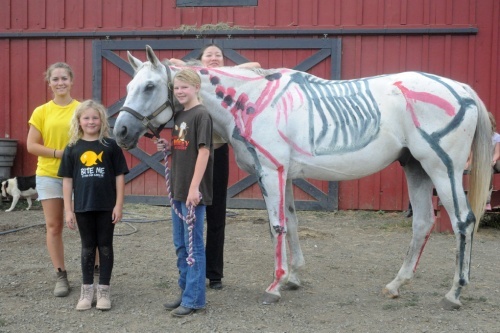 Learning, literally, about the horse’s makeup is just part of what’s available at Hunter’s Rest. International clinician Paul Striberry and other upper level teachers visit Hunter's Rest regularly to provide expert tutelage to back up our regular instruction program. Hunter's Rest always has a selection of fine sport horses, Thoroughbreds and young stock available for sale or on-farm lease. 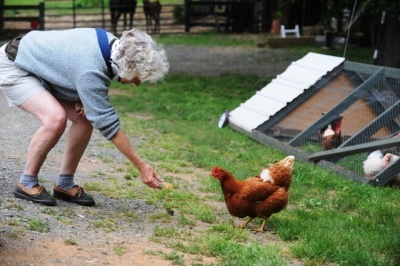 Farm owner Betsy Burke Parker prepares to move off the farm with the Old Dominion Hounds. The hunt meets at Hunter's Rest regularly. 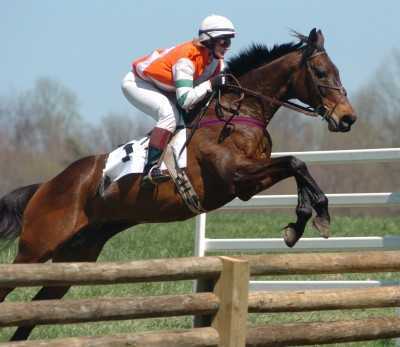 Steeplechasing is one of Hunter's Rest specialties. Here shown is 2005 Virginia Timber Horse of the Year Recanting, winner of five in a row (and counting!). 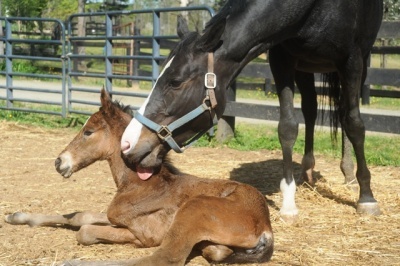 At Hunter's Rest, horses can be broken, started, trained, conditioned, rehabbed, taught to jump and more. Also specialize in 'gentle' introduction to cross-country riding (and galloping) for green and novice riders hoping to learn more about foxhunting, racing and hunter pacing. 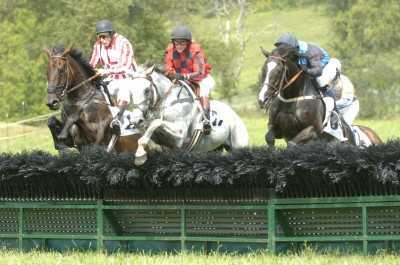 Hurdle racing and timber racing -- training and schooling too, are available at Hunter's Rest. Here shown is first-time hurdle starter Unexplainable, at center, who won his very first start over fences in September, 2005. 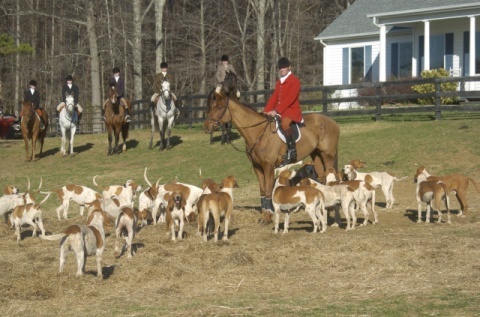 Old Dominion Hounds huntsman Gerald Keal prepares to move off with the renowned American pack from Hunter's Rest, while a group of farm riders wait in the background. 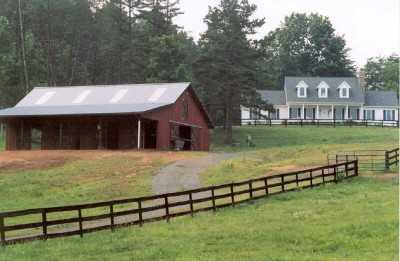 Hunter's Rest is located on the 'back 40' of the original ODH kennels property, today a privately owned farm called -- not surprisingly -- Old Kennels. ODH moved their kennels a few miles up the road to Orlean more than 30 years ago. 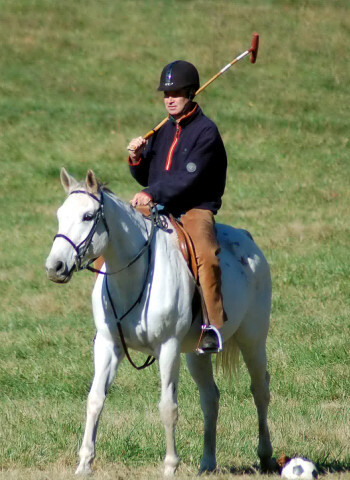 Adults and juniors thrive on the active Hunter's Rest lesson program - one that includes riding in and out of the arena as well as fun games such as polo and more. Following the U.S. Pony Club format of systematic instruction in hunt seat equitation, students benefit from more than 100 years of experience of Hunter's Rest owner/chief instructor Betsy Burke Parker and her mother, Jackie Burke. 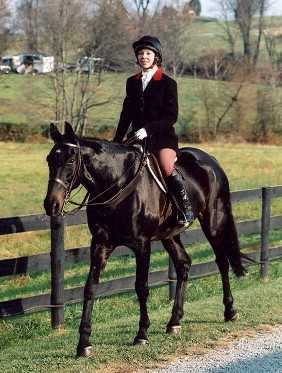 Jackie is an A-level pony club graduate and formerly held a rated judge's card from the U.S. Equestrian Federation. 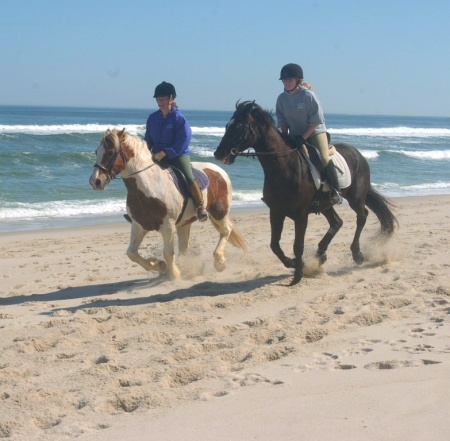 Hunter’s Rest offers uniquely designed horse vacations including this one to the beautiful Island Beach State Park in New Jersey, where we are able to ride in the surf! Looking south from the house, Battle Mountain and Fogg Mountain are in the background with the level, sandy-soiled gallop and schooling field in the foreground.